A-Frame Max Height: 11' 1"
A-Frame Min Height: 6' 1"
Rung Size: Inner - 1.5"
How to use the ladder click the link below. How to use the ratchet system of the ladder click the link below. 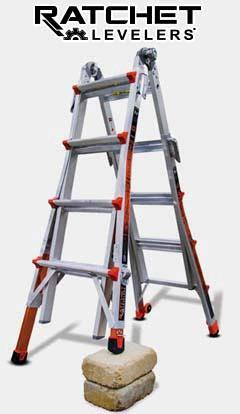 * Please call us for any questions on our ladder little giant m26 revolution rentals in Sterling VA, Herndon VA, Leesburg VA, Reston VA, Chantilly VA, McLean VA and Greater Arlington VA, Alexandria VA and Bethesda MD.